Good start to the year with new releases from Pat Metheny, presenting a slightly augmented Unity Band, and drummer Jeff Ballard. Between the two of them, these albums present a wide array of styles and exceptional musicianship from everyone involved. In all honesty, I had not been anticipating either album with any real eagerness, but found myself very pleasantly surprised with both. 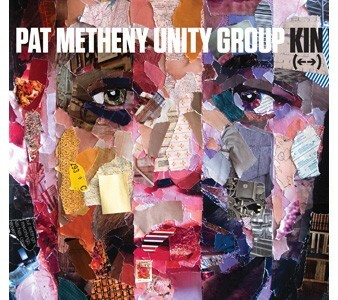 I gave a somewhat mixed review to the first Pat Metheny Unity Band album. The band, with Chris Potter on saxophone, Ben Williams on bass and Antonio Sanchez on drums, is certainly very talented and it’s not hard to find impressive technical feats on that album, yet I found some of it surprisingly sterile and it had the tendency of taking it’s own conceits a bit too seriously. Pat has come out with a second Unity Band album, the frustratingly titled “Kin <–>”, with the new addition of multi-instrumentalist Giulio Carmassi, which I find much more engaging than the first time around. While the first Unity Band album was mostly a quartet affair with Metheny’s ‘orchestrion’, an automated mechanical orchestra of his own devising, used rather sparingly, the new album has a much fuller sound. Chalk it up partly to more aggressive use of the orchestrionics and partly to Giulio Carmassi who is credited with a very impressive array of instruments in the liner notes: piano, trumpet, trombone, french horn, cello, vibes, clarinet, flute, recorder, alto sax, wurlitzer, whistling and vocals. With the exception of the vocalizations, which anyways only come up a handful of times, it’s sometimes hard to tell what Carmassi’s contributions are: is that vibraphone Carmassi, or the vibe heavy orchestion? To my ears his most significant contribution is on piano. Sometimes it’s good to have another fully chordal instrument in the band. Wherever the sounds are coming from, nearly every track presents a much more flushed out sound compared to the first album. I also find the compositions stronger this time around. I accused one or two of the tracks on the first Unity Band album of reaching for an air of through composed class by essentially tacking unrelated bits of music together. Listening to the new album, I was immediately struck by how well the composition hung together despite sometimes being rather complex. The transition from Metheny’s solo to Chris Potter’s on the first track, “On Day One”, is a thing of beauty. Metheny’s solo itself culminates in an excellent crescendo. It is followed not by restating the melody, but by repeating a short pattern that served as a bridge between the melody and Pat’s solo. Chris starts to shred on his own over rhythmic hits from the band, something so far unheard in the song. When the bass and drums come in behind full time, it is with a totally new pattern and rhythm. Somehow it seems so natural, the harmony is essentially the same, but the song has acquired an entirely new feel. Much of the songs on the album are like this: suites that go from quiet to intense and back, moving through the musicians and different styles naturally as the tracks “Rise Up”, “Sign of the Season” and the title track do. We also have a ballad or two in the form the songs “Born” and the unpronounceable “Kqu”. There is also something slightly different in the track “We Go On”, which, with its synthesizer and electronics and stereotypical groove, is practically a smooth jazz song. Yet, despite myself, I find it strangely compelling, no doubt once again because of an inspired turn on tenor by Chris Potter. All in all a highly successful album. Drummer Jeff Ballard’s new album, Time’s Tales, presents a much different, relatively stripped down sound. Playing as a trio with alto saxophonist Miguel Zenon and guitarist Lionel Loueke. Certainly far fewer instruments played at once, but there is no lack of music. The three of them dance about each other, the band constantly shifting it’s focus from one instrument to another. Together the trio fills up the space, playing a lot, but never seeming over busy. If I’ve ever had a complaint about Ballard, who is a preternaturally talented drummer, it’s that I’ve occasionally found his drumming dry, or non-dynamic. I found a hard hitting solo he played over a Cole Porter tune at a Brad Mehldau trio gig I saw distracting; certainly that was a time for a bit of subtlety, I thought. I may have felt that way then, but not with Times Tales, which is many things, but certainly not dry. Ballard grooves through street beats, soft balladry and rock songs with equal ease. Ballard only wrote one or two of the songs himself (not counting “Free 1” and “Free 3”, which are, as you might expect, free improvisations from the band), instead choosing to gather material from a variety of sources, including his guitarist, a standard, Bela Bartok and the rock band Queens of the Stone Age. It’s a challengingly diverse set of music, but the band works it well. The opening track, “Virgin Forest”, which happens to be my favorite on the album, is an island-African romp by Lionel Loueke, but it gives basically no indication of what is to follow. Up next is “Western Wren (a Bird Call)” which is just that, followed by an equally aptly named“Beat Streat” by Ballard, like a joyous street fair procession going by. The Queens of the Stone Age song “Hanging Tree” is itself fascinating, replete with the heavily distorted guitar necessary for a true rock song over what I can only describe as a rock-shuffle beat from Ballard. Perhaps such disparate material makes for a less cohesive package than the Metheny album, yet overall it works.